Grafist is an annual event held since 1997 by Mimar Sinan University in Istanbul. The aim of Graphic Design Week is to create an interactive arena for the exchange of the experiences of participants, review of works, meetings, and student activity through participation in seminars, lectures, workshops and exhibitions. During Grafist 18, with the participation of Krakow Poster Gallery and The Gardens of Art Association, exhibitions, workshops and lectures related to Polish poster art will be held. The theme of this year’s festival is Henryk Tomaszewski – one of the greatest poster artists, an outstanding graphic designer, illustrator and educator, as well as co-founder of the Polish School of Posters. 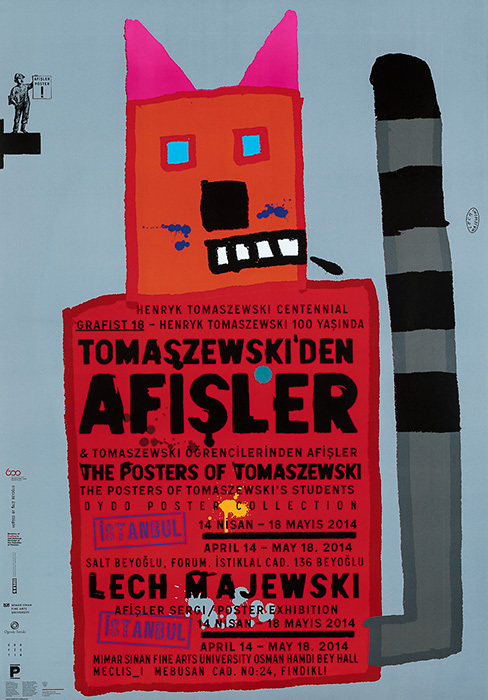 The gallery of SALT Beyoglu in Istanbul is to exhibit 50 posters by Henryk Tomaszewski – originals and reproductions – selected by Krzysztof Dydo, the project coordinator. The second exhibition will include works by Henryk Tomaszewski’s students from all over the world, including Alain Le Quernec, Pierre Bernard, Karel Misek and Polish artists such as Wiesław Rosocha, Mieczysław Wasilewski, Marian Nowinski, Rosław Szaybo and others. One of the most outstanding of Tomaszewski’s students, Prof. Lech Majewski, will also present his work at a separate exhibition at the gallery of Mimar Sinan University. He will lead workshops for students and take part in a meeting on contemporary trends in Polish posters.